Root vegetables are making their mark on the garden scene as autumn begins to blend into winter. All the vendors at the farmers market have an abundance of beets. Even though beets are not among my favorites, it seems a shame not to give them a go. Bright red borscht seems an obvious choice, and for years we have made a clear beet soup that almost gleams. An alternative seemed to be in order. The other thing about red beets is that they stain everything they touch, including your GI tract. 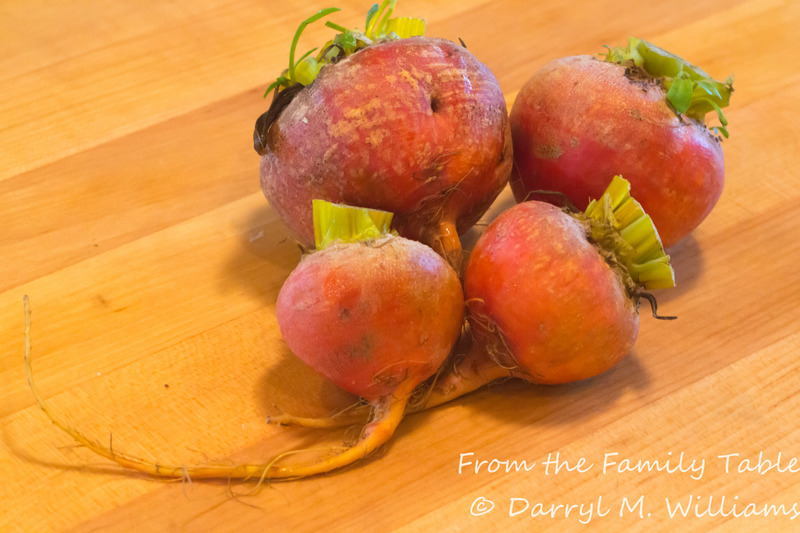 Golden beets seemed like a good alternative choice, and so I bought a nice bunch at a recent farmers market. Even then, there are several choices: beet salad, Harvard beets, or beets and greens. Honestly, the consistency of cooked beets is not pleasing to me, so I opted for soup. There are a couple of classic partners to beets: dill and sour cream. The recipe below combines those ingredients. Wash and dry the beets. Coat generously with vegetable oil and wrap individually in squares of aluminum foil. Place on a baking sheet lined with foil, and roast in the middle of an oven pre-heated to 350 for 30 minutes or until they are easily pierced with a kitchen fork. Remove from the oven, unwrap, and cool until they are easy to handle. The skin should slip off easily between your fingers. Cut the peeled beets into 1/2 inch cubes and set aside. In a medium saucepan over a medium flame, heat the oil and sweat the onions, covered, for 5 minutes until translucent and the juices have been released. Do not brown. Stir in the rice and cook for a minute or two until the grains are translucent. Ad the chicken stock, and simmer for 30 minutes or until the rice is completely cooked and soft. Add water as needed if the soup is too thick. Add the beets and simmer for another 10 minutes. Stir in the nutmeg. Remove from the heat and puree in a blender or with a stick blender until smooth. For aded smoothness, you may pass the puree through a strainer or chinois. Adjust seasoning with salt and pepper. Stir in the sour cream and dill. Serve hot or cold with a dollop of sour cream and more minced dill as garnish. Thanks, Shanna, for your kind comment. Dill is absolutely one of my favorite herbs. I use it all the time. Mine too. It has such a refreshing taste. And is so beautiful with its lacy fronds. 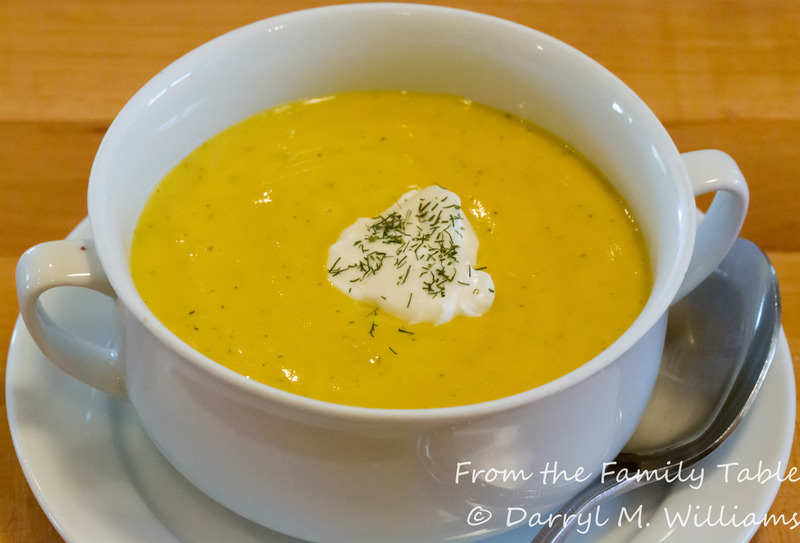 Your soup sounds special made with the golden beets and rice…nice!